Major Price Reduction reflects that the seller is motivated to get this SOLD, Best optioned boat in it's class. 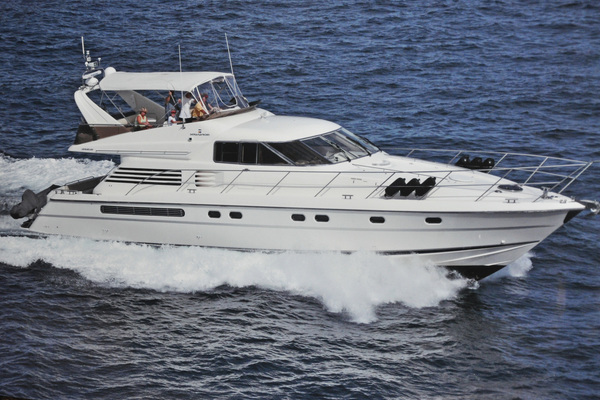 The Fairline 50 Phantom is a high quality 3 Stateroom Flybridge Motor Yacht with luxurious accommodations and generous spaces in a sleek sporty package. This boat has had extremely light use with all leather upholstery, interior woodwork, and outdoor seating surfaces showing well above average. The Engine Room and Bilges are pristine. This Boat is Loaded with just about any option you can think of, please review the key features and specs. 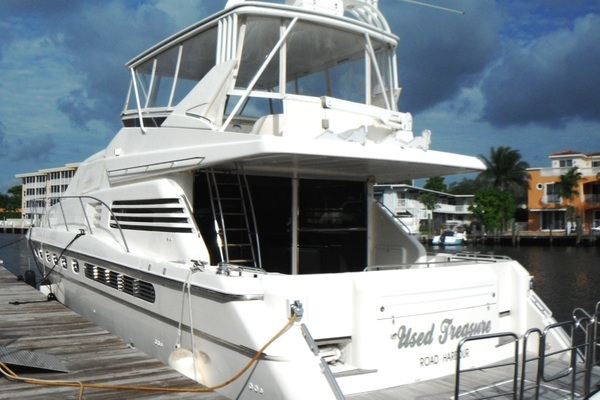 It is a perfect owner operator boat for long range cruising up the coast, in the islands, a weekend getaway, or for a simple evening out. The upgraded 715 hp Volvo D-12’s offer plenty of power, and the hull design with a transom deadrise of 18 degrees offers a soft, dry ride with low sound levels while underway. The Large Teak Cockpit is great for entertaining and it is noteworthy to mention the flybridge overhang extends to the transom for protection from the elements. There is a built in bench that also gives access to the fitted crew quarters that can be used for storage as well, and access to the swim platform is through the transom door. The Flybridge is accessed via the wide steps where you will find space typically found on larger boats, due to the extended flybridge design. There is aft seating with a table for socializing and a wet bar area that includes a refrigerator, griddle and sink. Forward is the full upper helm station with a lounge area to starboard. The factory installed Bimini Top can fold down for full sun. Access to the main cabin is through the steel sliding door, with a large leather C-Shaped sofa and table to starboard. To port is a barrel chair and built in cabinet with storage and a TV mounted on a electric lift. Forward to port is the galley and across to starboard is the lower helm station with separate Captain and Co-pilot seats. The Main cabin is bright and airy with generous head room and large windows with electric openings for fresh air. Down the steps to port and starboard are the two guest staterooms. There is a head and shower accessible privately from one of the guest staterooms, and a second entrance door in the companion way. The master is forward with its own en-suite head and shower. 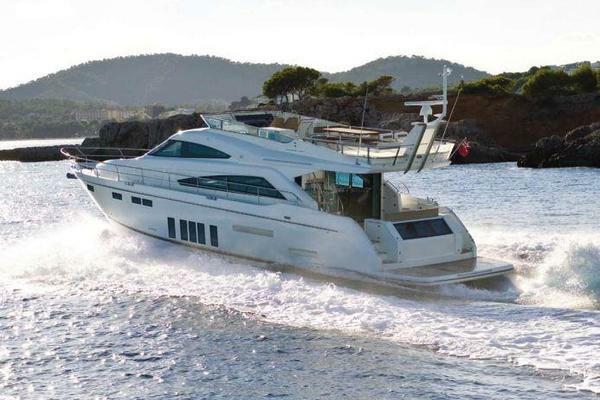 Our Fairline listing is a great opportunity to purchase a very nice 50' Phantom 50. 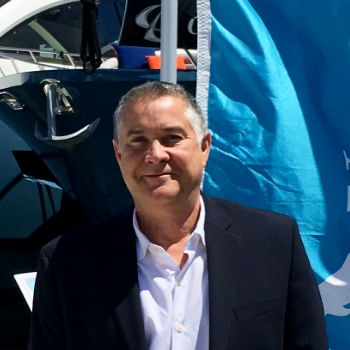 She is currently listed with United Yacht Sales broker Mike Kutrybala who can answer all questions about the boat for you. Please don't hesitate to reach out to our team of professional yacht brokers to schedule a showing. There are many yachts listed for sale on the MLS each with a different history. We look forward to helping you complete your search for the perfect boat or yacht for sale.